The poppies may just be starting to grow at my house, but they are blooming in my studio. It’s been six weeks since I have carved a block using pear wood, and now I know why cherry is used so much more than pear. I will still use pear as soon as the tendonitis goes away in my carving hand, but I will try to not make the same mistake of carving it continuously. In the mean time, cherry is a good substitute. This is lovely. I really like the cherry wood. 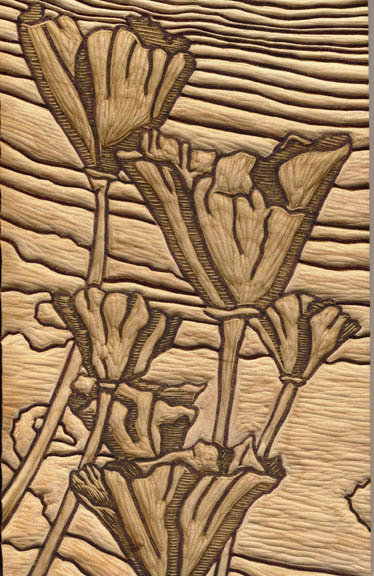 well, the carved block is beautiful.Hope to see the print soon.